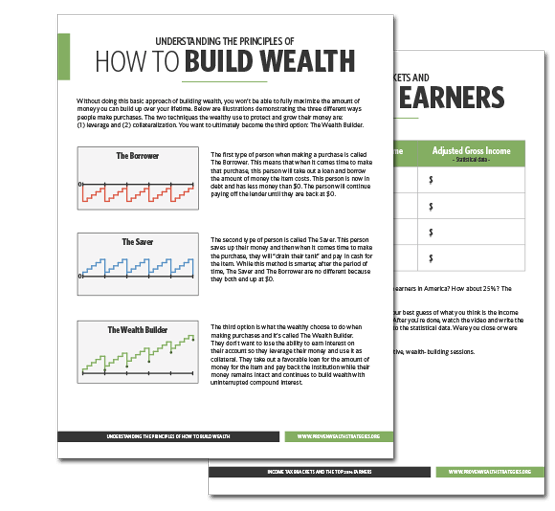 Discover the proven strategies used by the wealthy. There is absolutely no cost or obligation associated with an account. Grow your knowledge on how money works with truthful, straightforward lessons taught by a team of independent professionals. With over 18 visual illustrations, you have the ability to download and interact with the videos to help you learn in a whole new way. Under each video, there is a section called "Resources" which is a place for you to download files and go through the videos in a fun, engaging manner. Be given the exact information you need to make informed decisions about your financial future. Visual illustrations to help you better understand the financial principles. Whenever there is a section where you require additional information or have a question, you have easy access to your wealth advisor. Schedule a complimentary consultation if you're ready to move forward and would like an independent assessment on your wealth. Act now and receive these two bonus gifts! If you create your account today, we’ll throw in the following bonuses for FREE as a thank you for taking action on becoming financially informed. Shows you exactly what the wealthy are doing and outlines the steps. Gets right to the point and shows you the top five secrets.